We couldn’t decide which kind of sauce to put in for the entire salad so we created individually flavored servings! Upper left corner: Italian dressing. Upper right corner: BBQ sauce. Lower left corner: balsamic vinegarette. Lower right corner: Ranch dressing. I’m sure we’re not the only ones who have made the wrong amount of pasta for the amount of sauce we had, right? Well, a while back, my hand slipped and I ended up making way too much pasta that I needed something to do with. As it turned out, we also had red onion and celery that also needed to be used up. I had some great Black Forest Ham so my mind’s wheels started turning a bit. I had my idea in mind, based on some research I did but I didn’t know what kind of sauce to use. I didn’t want to ruin an entire pasta salad by choosing the wrong sauce so I decided to try out sample servings. 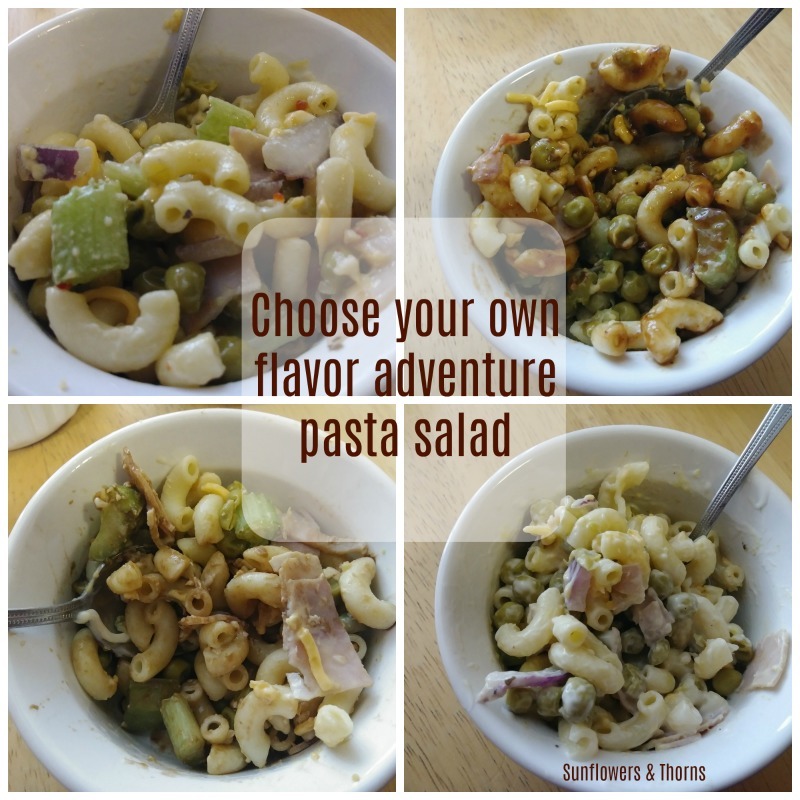 I still couldn’t decide and realized that’s OK. Here’s a hint: If you don’t want to let people choose their own flavoring, this pasta salad is quite tasty on its own. But it’s also more than OK to let people have their sauce and eat it too. Or, whatever. My measurements on some of this are vague because it was “to taste” and “what I had left”. I didn’t expect this to be “blog-worthy” the first time out, to be honest! Enough of my storytelling. Let’s get to the recipe! 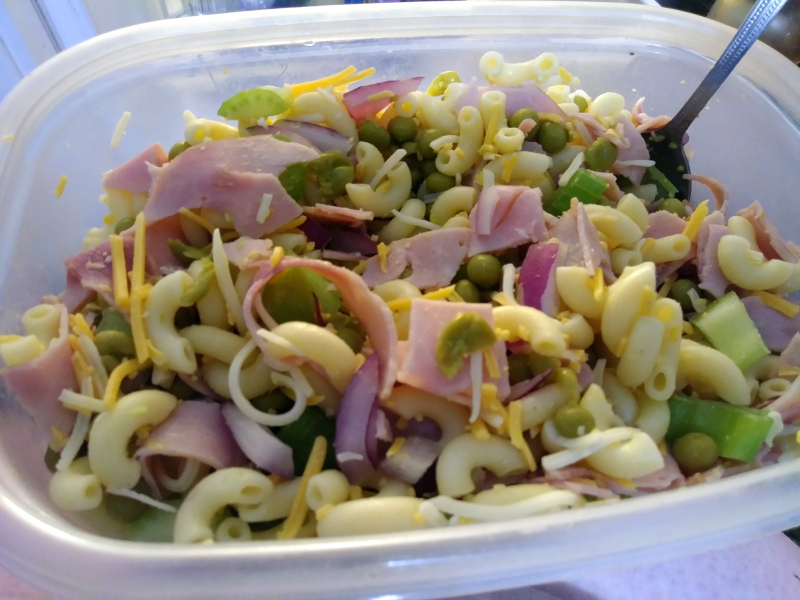 The pasta salad without any sauce yet. 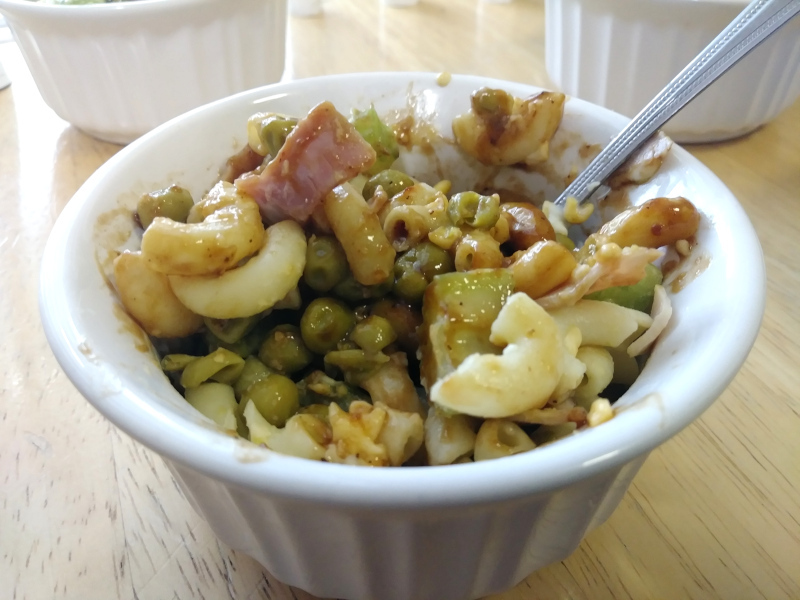 It has elbow macaroni, peas, celery, red onion, sharp cheddar, and Black Forest Ham. Sauces of your choice (we used Ranch dressing, various kinds of BBQ sauce, balsamic vinegarette, Italian salad dressing. The amounts will vary according to taste. See my notes below). Drain the peas and put it on top of the pasta. Chop the onion and celery. Place both over the peas. Chop the ham (or deli meat of your choice. Turkey would probably be good.). Place it on the veggies. Sprinkle the cheese over the entire thing. Mix it all up carefully without squashing the peas. Let people add their own sauces as they wish (I would do 1/2 a tablespoon for most sauces for every 1/2 to 3/4 cup serving. Unless it’s the vinegarette and do that to taste. I just used a few splashes). My favorite was the BBQ sauce! Second favorite was Ranch dressing. I also liked Carolina BBQ sauce and Korean BBQ sauce. I might be in love with BBQ sauce.